Recently, tremendous development has taken place in the field of X-ray diagnostic imaging at Nepal. Newer modalities are being applied in major hospitals and latest radiological equipments are being imported. Besides, small X-ray "set-ups" are added every day. This quantitative increase may have a positive impact on the health service system of the country; but the lack of control can cause serious problem especially radiation hazard to the radiation workers as well as public. Presently there are four tele-cobalt machines, three linear accelerators, three simulators, three high dose rate (HDR) brachytherapy, two gamma camera (SPECT), nine magnetic resonance imaging (MRI) machines, around 30 computed tomography machines and about 800 X-ray equipment in the country. There are around 400 qualified professionals (radiologists, radiation oncologists, medical physicists/radiation safety officers, radiographers, radiation therapists, nuclear medicine physicians, nuclear medicine technologists) who are working in the field of diagnostic radiology and radiotherapy. The main aim of radiological protection is to provide with accurate standards to practice safely with ionizing radiation for public, workers and patients, as is recommended by international code of practice , that leads to implementation of national regulatory framework. Till now, there is no legislative body or any Radiation Protection Act to set standards for radiation protection, radiological activities as well as any radiation monitoring system in Nepal. Official records of the exact number of the radiological facilities in operation are also lacking. A preliminary radiation survey (12 X-ray and 2 CT) was done at some facilities in Kathmandu and surrounding areas  which indicated the need to extend the radiation survey to other centers in Nepal, for finding out the status of radiation protection, awareness and training of radiation workers. To assess whether weekly equivalent dose received by the radiation workers are within the dose limits recommended by ICRP , or not. To make the radiation workers aware about the possible radiation health hazard and to assess their knowledge on radiation protection. To make an inventory of availability of equipment of the surveyed hospitals. To initiate steps towards establishment of Nepalese code of radiological practice and to develop radiation safety culture to benefit public. The questionnaire for radiation workers consists of twenty-five questions seeking information regarding professional responsibility, protection training, personnel dose monitoring, institutional and self-motivation towards radiation safety. In addition, the questionnaire also gives some information about the general understanding of radiation protection. Radiation survey for diagnostic radiology was done in 28 different hospitals which include 44 X-ray machines, 10 CT scanners, 2 mammography units and 2 catheterization laboratory. In radiotherapy, 3 tele-cobalt machines, 2 HDR brachytherapy, 3 linear accelerators and 2 simulators were surveyed at 5 different centers. Altogether, 33 different hospitals/institutions from Kathmandu and sub-regional/zonal hospitals from different parts of Nepal were monitored and 203 radiation workers completed the assessment form. Two different instruments were used for radiation survey. The radiation survey meter (GBD M20.273 FAG 2001190 FH 40F1) from Germany was calibrated at BARC, India. It is a portable battery operated dose measuring instrument. This survey meter has a range from 40 keV to 3 MeV which covers beam energy from X-ray to cobalt-60. Roentgen Gamma Ray Dosimeter (RGD 27091) is a well calibrated radiation survey meter from ADCL, University of Wisconsin, United States. The TBM-IC Mark V is a small ion chamber radiation monitor. Dose rate measurement range is from 0.1 mR/h to 9999.9 mR/h (mR option) and from 1 μSv/h to 99,999 μSv/h (Sv option) and total dose measurement range is from 0.01mR to 99,999.99 mR (mR option) and from 0.1 μSv to 999,999.9 μSv (Sv option). To measure the radiation level, six specific locations were selected. For general X-ray: At control console; Outside the X-ray room (door closed)/corridor; Patient's waiting room; Dark room; Behind the wall where X-ray tube is often directed and Leakage radiation (at 1 m from X-ray tube). The equivalent dose rates in air at different locations at the specified reference points mentioned were measured. For the purpose of dose rate measurement at different locations, a scattering medium (water phantom) was used. Measurement behind the chest stand wall was done without a patient or a phantom. Where Ni is examination number of type i and mA·min used for type i. Where is the equivalent dose rate level readings in air at each point in units of ; intensity (Im ) in mA units and Workload in units of . The study covers only major hospitals, zonal, regional and sub-regional hospitals and its generalization may not be valid for other small and less occupied hospitals. At some centers, it is doubtful whether the given mA or kV are actually correct as shown in control console because there is no measuring/verifying equipment and no quality control program to maintain the quality of the equipment. The workloads  that has been taken from DIN standard based on German workloads might be little different than workloads at some hospitals in Nepal and it has been used according to conservative criteria. Despite early recognition of the potential hazards of ionizing radiation and documentation of these hazards over several decades, problems persist regarding the safety of medical procedures that use ionizing radiation. This study is to evaluate current attitudes and radiation protection practices among staff following recent reports of the dramatic increase in radiological practice in Nepal. A questionnaire of twenty-five questions seeking information regarding professional responsibility, protection training, personnel dose monitoring, institutional and self-motivation towards radiation safety was asked to fill it by radiation workers. Altogether 203 radiation workers including radiologist, radiographer, dark room assistant, radiation oncologists, radiology residents, radiotherapy residents, bio-medical engineer and medical physicists answered the questionnaire representing the different hospitals of the country. Distribution of personnel by profession participated in filling the questionnaires are shown in percentage in [Figure 1]. The maximum number (35.6%) of the radiation worker has less than five years' experience which means, young radiation workers are in this field. There is no radiation protection training available in Nepal. Most of the radiation workers are aware that Nepal still does not have Radiation Protection Act. Most of the radiation workers have chosen high priority level on radiation safety. In the question regarding awareness about radiation hazard, exposure rate (μSv/h) and dose limit for radiation workers and general public, the responses were as: Almost 96.1% choose that they are aware on radiation hazard, 84.2% are aware on exposure rate but only 52.7% know the dose limit for radiation workers and 48.3% know the dose limit for general public according to correctly mentioned dose limit. Five different options (none, low, medium, high and very high) were provided to determine the radiation risk for patient in different clinical cases like X-ray examination, CT examination, Nuclear Medicine examination, chemotherapy treatment, USG examination, radiotherapy treatment and radioisotope treatment. 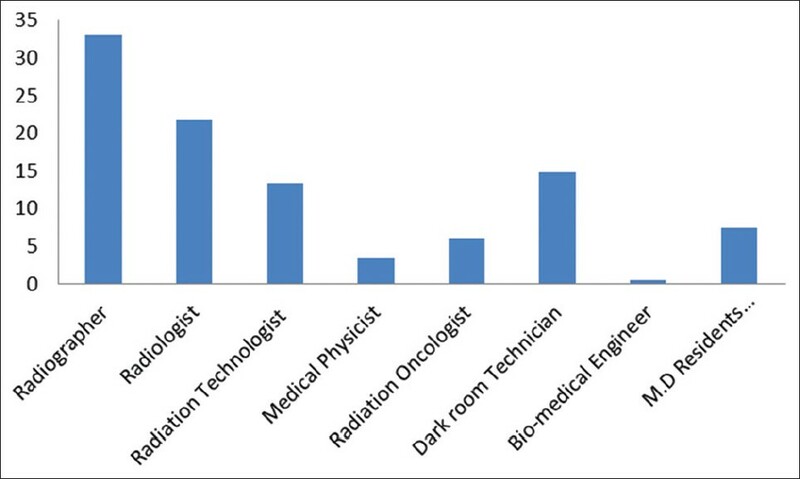 The responses were analyzed, which indicates that around 70% of the radiation workers have knowledge on radiation risk for the patients in different clinical cases which use ionizing radiation in medical practices. About the question regarding the impact of different solutions to help workers to be safe and feel safe from ionizing radiation, the responses indicates more than 80% of the radiation workers knows that using a protective items (lead apron, lead glass, time and distance etc.) and legal regulations (73.4%) help to protect them from ionizing radiation. In different options for responsible person for informing public on radiation risk, 88.7% choose radiation protection expert of the hospital. This indicates that Radiation protection expert of the hospital should be the responsible person for radiation protection. This would also indicate that there must be a radiation protection officer in hospitals74% of the radiation workers would like to receive more information of ionizing radiation risks in health effect. Question regarding consequences of harm due to irradiation, the responses were quite satisfying meaning that most of the radiation workers are aware on the harmful effects of radiation. Questions regarding, different options (evaluation of exposure and doses, evaluation of mortality, evaluation of morbidity, evaluation of cost benefit and evaluation of Damage/health) for useful way to evaluate the radiation risk, the responses were analyzed, which indicate that evaluation of exposure and doses is the best way to evaluate the risk of radiation. There is not automatic exposure control in most of the X-ray units. Window at the X-ray room and also door without lead protection were found at some hospitals outside the Kathmandu region. Some unqualified persons were found to be exposing because of the lack of staff. There is no quality control program in diagnostic radiology but there is a quality control program in Radiotherapy facility centers. In diagnostic radiology, there is only a maintenance contract with the supplier company in few hospitals. QC program should be performed on the X-ray equipment regularly, following international codes of practice. The basic radiation protection principles of Justification and Optimization should be taken into consideration in this period of rapid increase of investigation following the availability of new equipment. The maximum calculated equivalent radiation level (H W) is 0.006 mSv/week, which is within the safe limit. The operational dose limits  for radiation workers: 0.4 mSv/week and for public: 0.02 mSv/week. Radiation dose level measurement was also done at patient waiting area and inside the dark room and leakage radiation test was done by closing the collimators and reading were taken at 1 meter distance from the tube. There is a leakage in almost all units which is not good in view of protection of the patients and average reading was 0.0075 mSv/week. It is also found that in two centers, collimators are not working. This is the first time leakage radiation survey was done in Nepal. Radiation survey was done at all five different radiotherapy centers. Radiation dose level at radiotherapy centers shows that they were within safe limits shows the measured locations in radiotherapy. For cobalt-60 and HDR Brachytherapy, measurements were taken in beam-off position at six different points, one meter away from the source, at fifty cm from the source head, at corridors. Beam-on position measurements were taken at control console, patient waiting room and just outside the treatment room door. For Linear Accelerator, measurements were taken with large field size and with different energies at the door, control console and behind the primary wall. The survey result and the readings show that all radiotherapy centers are built according to protection criteria. , The radiation survey at one linear accelerator room shows 15 μSv/hr at the corner of the wall at 35 × 35 field size with 20 MV photon beam, but the dose is still under the safe limit. All radiotherapy centers have medical physicist/radiation protection officer trained and educated from India and abroad and there is quality control program. All the staffs working at radiotherapy center including radiology department are being monitored by TLDs. Altogether, 33 different hospitals/institutions from Kathmandu and sub-regional/zonal hospitals from different parts of Nepal were monitored. Radiation survey for diagnostic radiology was done in 28 different hospitals around Kathmandu and different parts of Nepal which include 44 X-ray equipment, 10 CT scans, 2 Mammographs and two catheterization laboratory. In radiotherapy, three tele-cobalt units, two HDR brachytherapy, three linear accelerators and two simulators were surveyed at five different centers. A questionnaire was required to be filled in and 203 radiation workers completed the questionnaire. As a result of the evaluation of the questionnaire, we can say that around 70% of the radiation workers are aware of radiation safety issue. Surveyed 44 X-ray units and 10 CT units working areas are safe. Radiation survey around the mammogram unit shows that all the area is very safe and built according to protection criteria. Radiation dose levels at five radiotherapy centers show that all the reference points are within safe limit. The survey result and the readings show that all radiotherapy centers are built according to protection criteria. Personnel monitoring for radiation workers is a big problem. The result shows that around 65% of radiation workers are not monitored for radiation. The surveyed hospitals with medical physicists have TLDs for personnel monitoring. The TLDs used in Nepal, are form Bhabha Atomic Research Center (BARC), India. There is a great need for rules, regulation and Radiation Protection Act in the field of radiation in medical field. There is no quality assurance program in diagnostic radiology but has a maintenance contract with the company at few centers. But there is a QC program in Radiotherapy centers. A QC program should be performed on the X-ray equipment regularly, following international codes of practice. There must be regular quality control parallel to maintenance program for the X-ray equipment at regular intervals. The basic radiation protection principles of Justification and Optimization should be taken into consideration, in this period of rapid increase of investigation following the availability of new equipment. The detailed evaluation of the answers given by the personnel working with radiation might provide good indication about the strategy to adopt in designing training program, very much needed. Through proper radiation education and training and regularly organized seminars, conferences people are becoming more and more aware about the benefits of radiation, its uses in medicine. By establishing basic safety standard and radiation control authority, rules and regulations can be enforced in the country effectively and efficiently. 1. Cuaron JJ, Hirsch AE, Medich DC, Hirsch JA, Rosenstein BS. Introduction to radiation safety and monitoring. J Am CollRadiol 2011;8:259-64. 2. Radiological protection for medical exposure to ionizing radiation Safety Guide No. RS-G-1.5 (Vienna). IAEA;2002. 3. Optimization of the radiological protection of the patients undergoing radiography fluoroscopy and computed tomography. Final report of coordinated Research Project in Africa, Asia and Eastern Europe TECDOC-1423 (Vienna). IAEA;2004. 4. Adhikari KP, Rawal KB. Radiation survey at different public and private hospitals in Kathmandu valley and different parts of Nepal. Radioprotection 2007;54:34-6. 5. The 2007 recommendations of the International Commission on Radiological Protection. ICRP;2007. p. 37. 6. Radiological Protection in Medicine. ICRP;2007. p. 6. 7. Medical X-ray equipment up to 300 kV. Rules of construction for structural radiation protection. DIN 6812;2006. 8. Moreno C, Cenizo E, Bodineau C, Mateo B, Ortega EM. Analysis of shielding calculation methods for 16- and 64-slice computed tomography facilities. J Radiol Prot 2010;30:557-65. 9. Structural Shielding Design for Medical Use of X-Ray Imaging Facilities. NCRP 147;2004. 10. Bakalyar DM, Castellani MD, Safian RD. Radiation exposure to patients undergoing diagnostic and interventional cardiac catheterization procedures. Cathet Cardiovasc Diagn 1997;42:121-5. 11. Structural Shielding Design and Evaluation for Medical Use of X-Ray and Gamma Rays of Energies up to 10 MeV. NCRP 49; 1976. 12. McGinely PH. Shielding technique for radiation oncology facilities. Madison, WI: Medical Physics Publishing;1998.